Scanning speed: 25 pages per min. Oops - we don't appear to have a video for the SmartOffice PS283. Plustek's DocAction makes scanning as simple as pressing a button. With the Plustek SmartOffice PS283, you can scan directly to searchable PDF and other common image file formats and then send your scanned documents to email, printer, folder or FTP site. All you have to do is press a button on the scanner! 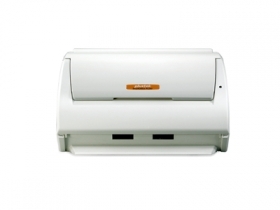 The SmartOffice PS283 also includes an industry standard TWAIN drivers, that allows the scanner to be used with thousands of document management and image enabled programs. The PS283's small footprint and its ability to scan rigid cards such as insurance cards, credit cards and membership cards make the PS283 ideal for applications like: patient registration, pharmacy prescription scanning, accounting, remote deposit and more. The included TWAIN drivers ensure compatibility with your application.